Each year, we take a look at how the golf industry is performing in our State of the Industry report, and superintendents consistently report that labor is their No. 1 issue. It seems that 70 years ago was no different, as turfgrass research pioneer O.J. 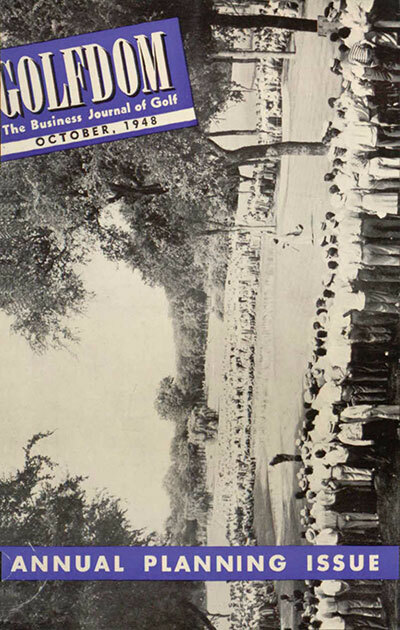 Noer began his October 1948 column in Golfdom by discussing labor and golf courses’ reliance on transient labor from high school and college students — with one club in particular having a turnover of more than 60 workers in a single season. Noer offers suggestions for the labor issue and other turfgrass topics from 1948, including snow mold prevention, wind burn injuries on fairways, shallow-rooted turf on greens and spiking greens. Labor continues to be a major golf course problem, even more serious than during the war. Most clubs were worse in active growth when snow blanketed the off at the start of this season than ever before. They limped along until June and relied upon high school and college students during the summer. The boys were satisfactory for mowing, but not for painstaking tasks. Now that they have returned to school, the complaint about being shorthanded is prevalent again. Labor efficiency has been low, which is to be expected from transient workers and inexperienced youths. One club had a turnover of more than 60 during the season. Some may wonder where they come from. Recruiting and training new men is costly. Good men will not take temporary jobs when they can have permanent work. Clubs must recognize that fact. The change to mechanized equipment and higher hourly rates of pay have been the excuse for reducing the number of workmen on the course. Some clubs have cut the force In half, others have tried to operate an 18-hole course with three and four men. It means less frequent mowing of the greens and skimping in other places. Everything goes fine for a year or two. Then troubles multiply because there has not been enough help to do the essential things. Power greens mowers save fewer man hours than is generally believed. The big saving is in efficiency during hot weather. Workmen are less exhausted and more fit physically to do other tasks afterwards. Greenkeepers and club officials should analyze work requirements carefully and then provide a minimum crew of reliable workmen and provide permanent work for them. This skeleton crew can be augmented with students during the summer. Courses will be better, at little or no extra cost, when this is done. The season of 1948 started out as a bad one for turf on golf courses in the section from Montana to New England. The winter was severe for greens and patches of matted creeping bent on some fairways. Recovery was very slow because the weather in early spring was dry with cold nights. A mild fall and early snow in 1947 favored snow mold. Grass was green and in active growth when snow blanketed the ground in November. Very few greenkeepers had applied fungicide that early for snow mold prevention, and didn’t get a chance because the ground stayed covered until the midwinter thaw In February. Spring-like temperatures in the seventies prevailed for a time then. Winter returned with a vengeance in March when temperatures dropped to 10 to 20 degrees below zero. Snow mold was bad for two reasons. The grass did not stop growth before being blanketed with snow. Very few greens got the protective application of calomel-corrosive mixture, which Is still the most effective fungicide for snow mold. One greenkeeper mixed calomel-corrosive mixture with topdressing and applied it on top of the snow. The amount of topdressing was one-half to two-thirds of a yard per green. His greens came through without damage. The use of nitrogenous fertilizer should stop in the snow mold belt sufficiently early — usually by mid-September — to give the grass a chance to harden off before the season stops. Fungicide should be used and applied preferably before the first permanent snow, otherwise greens should be cleared of snow, or the fungicide should be mixed with topdressing and applied on top of the snow. The rate for calomel-corrosive mixture should be 3 to 1 ounces per 1,000 sq. ft. Another treatment at half rate should be made after snow melts in midwinter, or early spring. Another type of injury, similar to the windburn which devastated evergreens, was widespread. Afflicted greens started growth in early spring, but the young grass soon withered and turf on large areas became brown. The spring was very dry and windy at the start. Damage was similar to the “wind burn” of evergreens. The drying winds dried or desicated the plants. Greens or one course came through without a blemish, yet those on a course not more than a mile away were bad. Examination disclosed deep roots on the one band and a few shallow ones on the badly damaged greens. The deeply rooted turf resisted drying, but the others didn’t. Had it been possible to apply a little water one or two times a day, wind burn damage could have been prevented. Recovery was slow because of the cool weather. Some clubs patched with sod. Others seeded. Best recovery from seed was obtained where greens were spiked enough times to tear out the dead grass and enable seed to make contact with the soil. Even then late seedings did better than early ones. Wind burn injury was bad on some fairways. Damage was confined to the spots of matted creeping bent. The grass in these areas was shallow rooted. On some courses the grass started to turn green, then growth stopped, the grass began to wilt. Then it died and turned brown. Loss could have been prevented by watering in most cases. Some clubs raked out the dead grass, added soil and seeded with Colonial bent. Germination and growth were poor because of the adverse spring weather, Others spiked or cross-disced enough times to destroy the mat and make a seed bed. Recovery came from the seed and from the old bent also. There were enough live joints on seemingly dead grass stems to produce new plants! Matted fairways need periodic renovation or aerification with a disc, a rotary hoe, or a West Point aerifier. These implements will thin the turf and make for deeper root growth. There will he less wind burn injury, and localized dry spots will not occur in summer. Aerification should be done in fall and again in spring when turf is badly matted. The actual growing season was about average, too wet in some places and too dry in others. Courses in the wet areas complained about crabgrass and clover on fairways and scald on greens. Those in dry regions had brown fairways and greens developed localized dry spots. Daytime wilting was troublesome in both places. There was altogether too much shallow rooted turf on greens. It is hardly reasonable to suppose that acidity and faulty fertilizer practices were the sole causes. Compaction, overly wet soil throughout the spring and early summer, and an excessively matted turf were more likely reasons. They restrict soil aeration. Roots always stay near the top when the soil below lacks oxygen. Compaction and other bad soil conditions, such as sand and peat-like layers, can be corrected by forking, by drilling, or by aerifying. Hand forking is slow and tedious, drilling takes about a day for a green, and the aerifier will do all 18 greens in about a day. Hand forking and drilling disfigure the surfaces least. Greens that are especially bad should be aerified spring and fall for several years. Most or all of the cost will be recovered in lessened daytime hand watering in hot weather. Matted turf on greens started to become bad during the war from Infrequent mowing. The condition is aggravated by scalping rollers on the front of greens mowers. The situation is getting worse rather than better. There are altogether too many greens with too much grass on them. Matted turf is the principal cause of localized dry spots on greens. Turf on the dry areas wilts and dies In hot weather unless soil moisture is restored by forking or other means. Sprinklers will’ not wet the soil below the top inch. Matted greens should be cross-raked and cut close several times before growth starts next spring. They should not be topdressed until a tight turf is obtained. After that, greens should be mowed every day, except one at the most. Greens on the best courses are cut at 3/16 inch. Mowers should never be set higher than 5/16 inch, and scalping rollers should be eliminated where possible, otherwise the comb should be used. There is a tendency to spike greens during the season. It is done every 7 to 14 days. Spiked greens take water better. Spiking helps prevent dry spots, but will not cure them. Holes are not sufficiently large or deep enough. A spiker should not be used on a hot day when grass is wilting. The grass around each spike hole will wither, turn brown and die. Then the green looks like dollarspot has been bad. Greens that get little or no topdressing, or where manure compost is not a constituent of the mixture, need more potash than is contained in fertilizers with only 2 to 4 per cent potash. Programs which have provided adequate amounts of phosphoric acid and potash in spring and fall, with nitrogen as needed throughout the growing season have been very successful. The quantity of potash should be not less than 8 to 10 pounds of actual potash per 1,000 sq. ft, each year. Chlorosis was severe on some greens. It was mistaken by some for disease and others blamed chemicals. At the start the grass is golden yellow In color (hence the name chlorosis lack of color) and leaves are soft and tender. Normal color generally returns in a day or two. When it doesn’t, the grass dies, turns brown, and the spot looks like scald or a burn from chemicals or fungicides. Temporary iron deficiency is the cause. That is the reason for the golden yellow color. Iron is a constituent of chlorophyll, which is the green substance in plant leaves. Chlorosis is most common after heavy down-pouring rains which saturate the soil temporarily Those who used ferrous sulphate stopped loss of grass. Best results were obtained by spraying ‘a to 1 pound of copperas, or ferrous sulphate on a green and not watering in. The iron was absorbed by the leaves and restored normal color In 12 to 24 hours. During a month of wet weather in Oklahoma it was necessary to spray once a week with the iron on several courses. Tree roots in greens and tees continue to cause trouble. It is impossible to keep grass green along the edges of some watered fairways because of them. Cottonwoods, willows, poplars, and elms are especially bad. Their roots are apt to clog tile lines also. Trouble occurs in hot weather. The tree roots rob the soil of its moisture. Surfaces become hard, and the soil underneath is compact and dry. Sometimes the offending trees can be dispensed with. 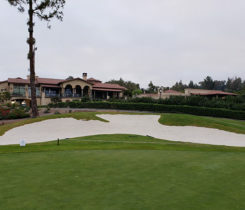 Otherwise, trenching to sever the tree roots and .facing the trench with sheet metal, or cutting the roots with a root pruner, such as the one made by Jim Haines of Denver CC, is the best thing to do. Ants are always a nuisance on sandy greens. Chlordane has solved that vexing problem. It has done a good job on cut worms and sod webworms also. Rates have varied, but from Vj to 1 pound of 40 to 50 per cent material on an average size green has given good results in the Midwest. Effects have lasted four to six weeks. The results with 2. 4-D for weed control have been extremely good for broadleaf weeds, especially dandelion, buckhorn, and plantain. It kills knotweed in the seedling stage, but is less effective afterwards. Clover has been checked but seldom killed completely. The results with chickweed have been disappointing. Indications are that some other chemical, such as sodium arsenite, will have to be used to kill the common type on watered fairways. When 2, 4-D has been used enough times to kill the chickweed. it has damaged the bent grass seriously. The trend seems to be toward using 2,4-D in the early fall rather than in spring for dandelion. By waiting until then the spring crop of seedlings is killed as well as the old plants. Crabgrass is less apt to become troublesome also. Some clubs obtained such miraculous results with 2,4-D that they thought it alone was the answer to good fairways. Those who did that and failed to use fertilizer where it was definitely needed, have gone from bra ad leaf weeds to clover. 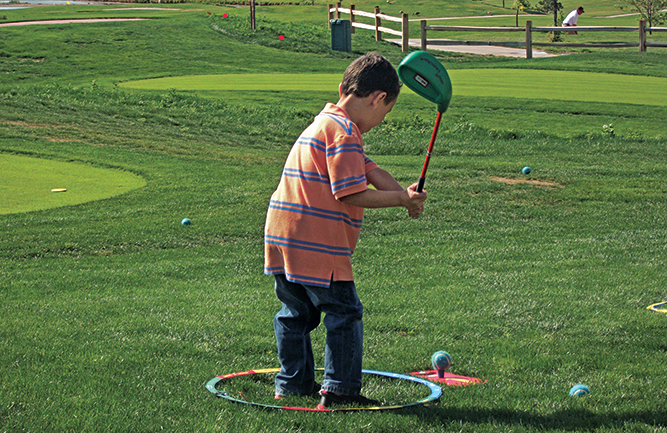 Golfers seem to gripe more now than they did before. Fairways continue to be a big problem, but they are becoming better in most places. Clubs with watered fairways, which have changed fertilizer programs and are fertilizing in fall, then in late spring and again during summer at light rates, invariably report better results than the old method of fall only, or spring and fall. Turf does not need nitrogen in early spring, but benefits from a slight lift with this growth-producing element during the summer. The use of some Colonial bent on unwatered fairways is receiving attention, notably in the Cincinnati area. Three of the courses in that city have Astoria bent and bluegrass in the fairways. The bent has done well for more than ten years without water. There is less crabgrass in the bent-blue grass turf and players obtain better lies. Grubs were bad in parts of the Middle West. Results with D D T and Chlordane on the phyliophaga grub of the three-year cycle grub of the May or June beetle were disappointing. One club used 50 per cent DDT at 50 pounds and 50 per cent Chlordane at 28 pounds per acre without obtaining practical control of the grubs. Yet DDT gave excellent control of the annual June beetle grub in southern Ohio and Kentucky. Apparently it is Important to know the species of grub. In the southwest, Southern Hills CC at Tulsa pioneered turf improvement on fairways several years ago and pointed the way to good turf on watered fairways In that section. Before that, their watered fairways were mostly crabgrass and clover. Now they are a velvet-like carpet of Bermuda grass. They used sodium arsenite to kill the crabgrass and clover. Then they fertilized generously to obtain a solid mat of Bermuda grass. The Memphis CC did the same thing last year, and had exceptional fairways for the National Amateur In September. Their Bermuda greens were exceedingly good also.